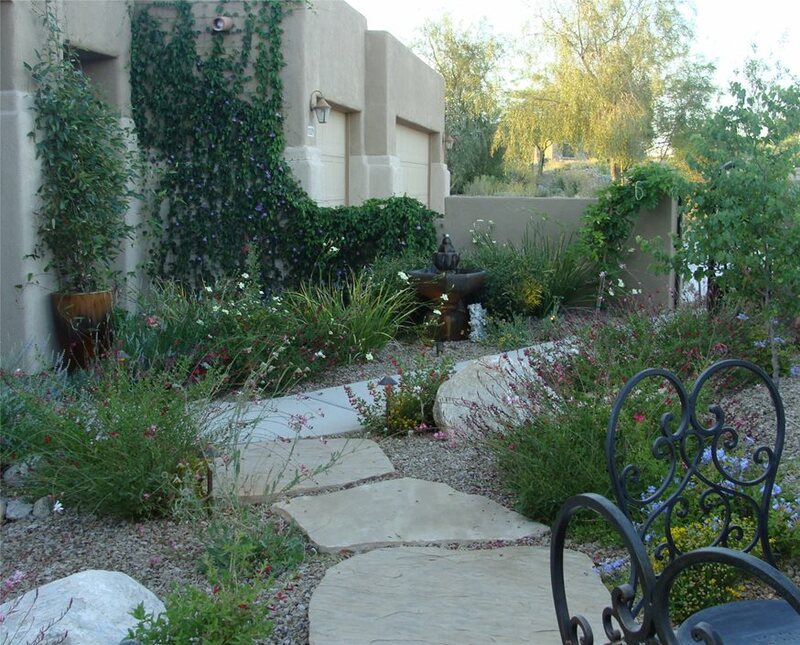 Succulents and ornamental grasses grow outside the courtyard walls. The courtyard features a small flagstone patio with bits of bright ceramic tiles in the joints. 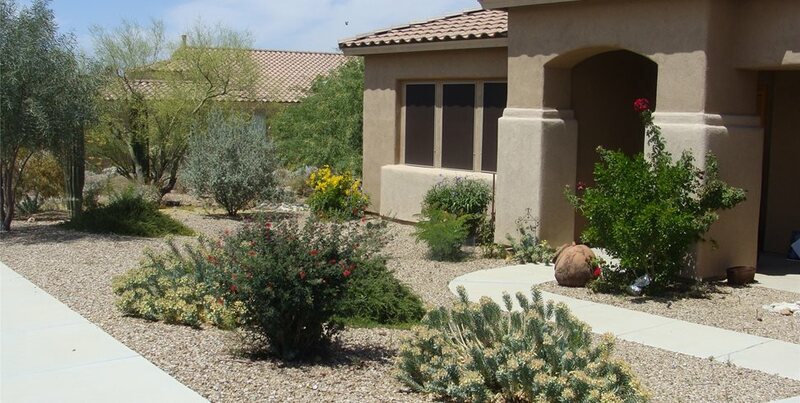 A combination of colorful shrubs and vines help this desert garden to appear lush. Glass pebbles in a swirl design were imbedded in the concrete next to the gate. 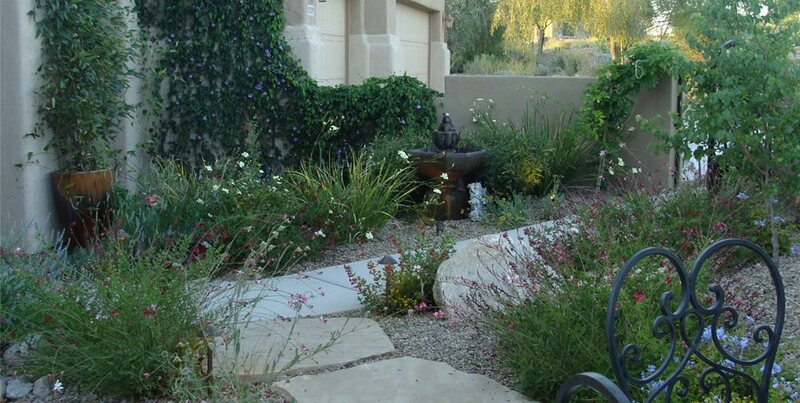 The property was gently graded to create a detention basin for rainwater. 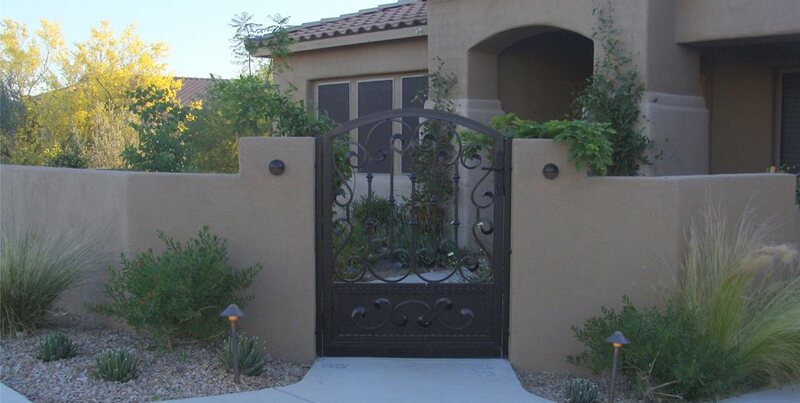 A unique gate distinguishes this yard from the other homes on the street. 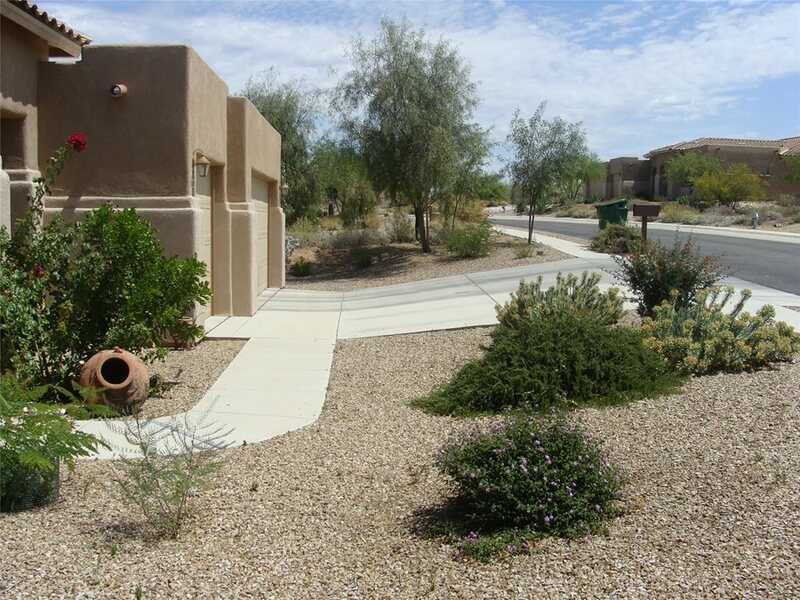 A before picture of the front yard. 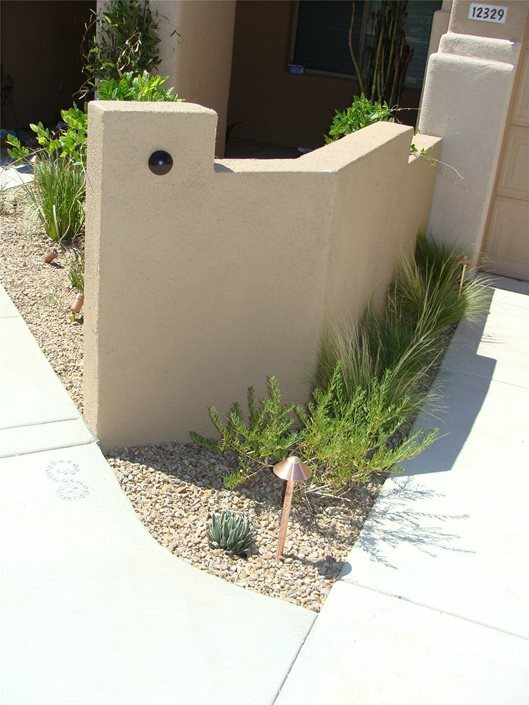 The downward slope of the yard used to cause rainwater to collect near the home's foundation. 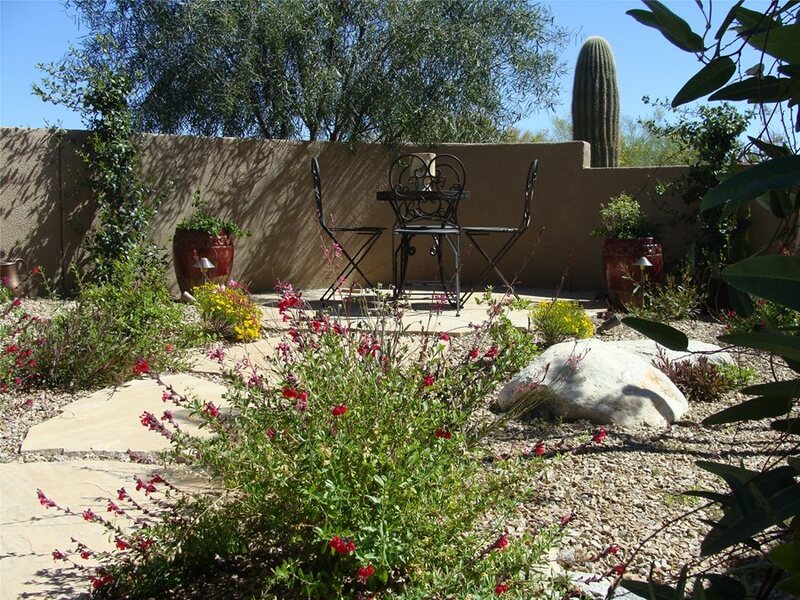 Tucson landscape designer Rachel Gioannini loves her job. It's apparent when she speaks about her work. 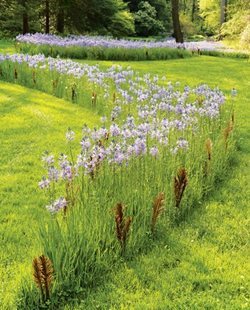 For her, landscape design is more about people than plants. 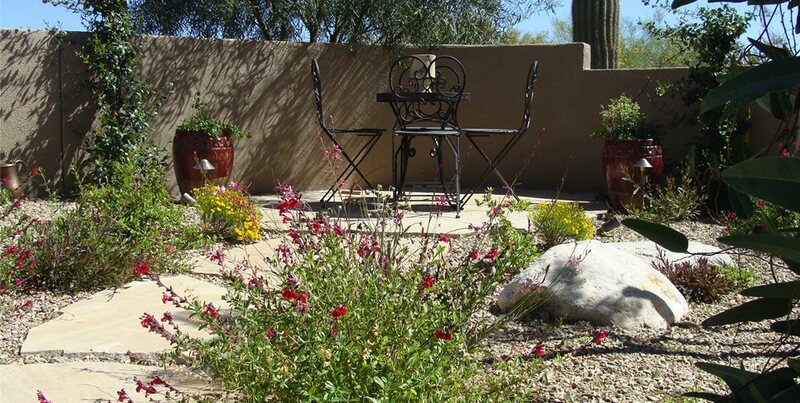 Her goal is to create outdoor spaces that are welcoming, comfortable and serene. 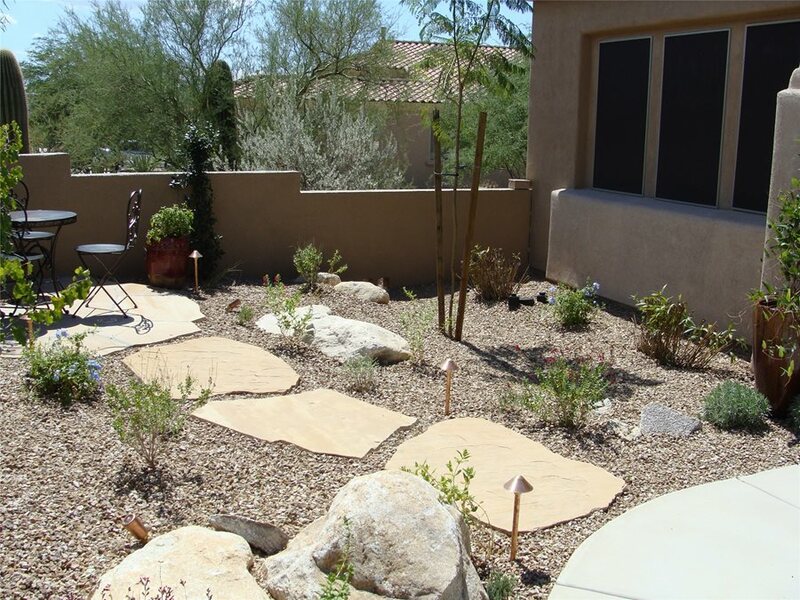 Recently, she transformed a non-descript front yard into a beautiful courtyard garden for a Marana couple, their children and their dog. "This front yard was no different than any other home on the block: a few ordinary plants and an angular walkway," recalls Gioannini. 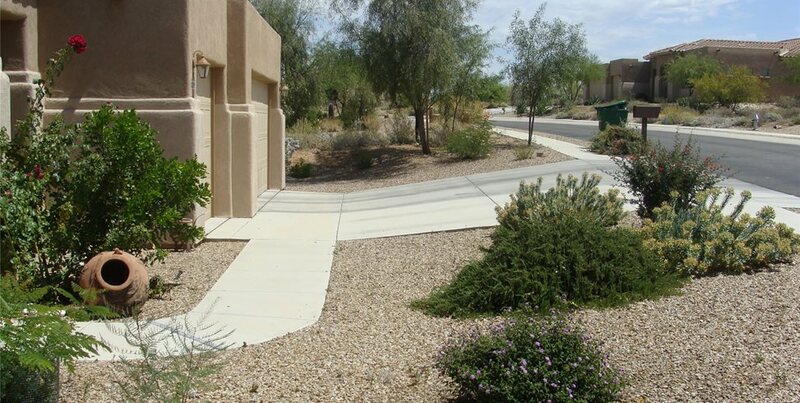 She calls this type of landscaping the "builder's special" - straight paths and typical plants installed throughout a housing development as the last phase of construction. 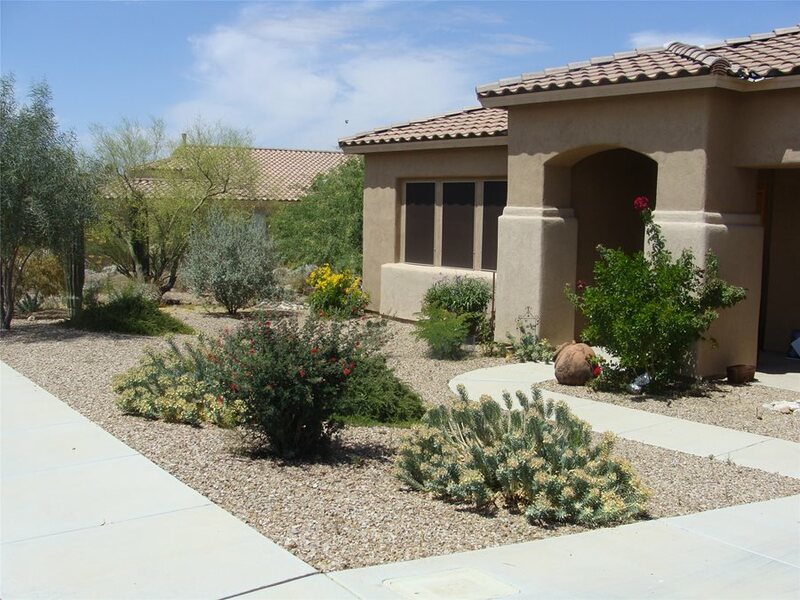 While much of the existing landscape was removed, Gioannini decided to keep a native saguaro and a mature acacia tree. The sidewalks and walkways were torn out in preparation for new hardscaping. Before designing the courtyard and selecting plants, Gioannini got to know her clients. "Helping clients put their own stamp on their yard is what I love to do," she says. In order to create a personal space, she spends time talking with and observing her clients. "I get just as much information from non-verbal communication as I do from verbal," Gioannini explains. For each project she takes note of the style of the client's home both inside and out, she also watches how they act and tries to reflect their personalities in her designs. 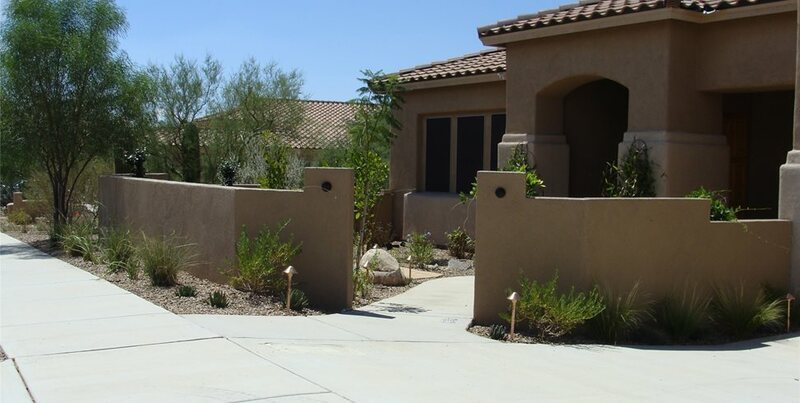 Pro Tip: If you and your spouse have trouble seeing eye-to-eye when it comes to landscaping your yard, hire a designer. A designer will help you find common ground and create a space with which you will both be happy. 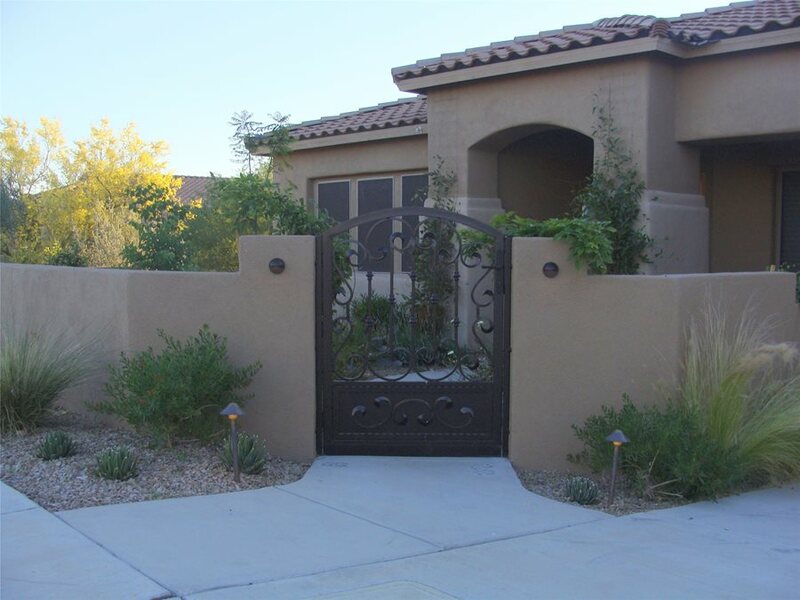 For this project, she suggested adding small bits of ceramic tile into the flagstone patio's grout lines as well as imbedding glass pebbles into the concrete near the front gate. To make the wife, who is from Puerto Rico, feel at home she also included many colorful plants in her design. "It's little details like these that make the yard uniquely yours," says Gioannini. 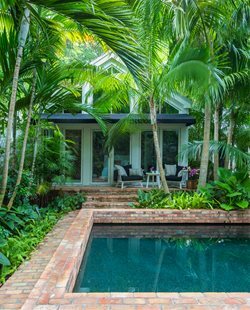 Low stucco walls were built around the perimeter of the property, turning the front yard into a private courtyard garden. 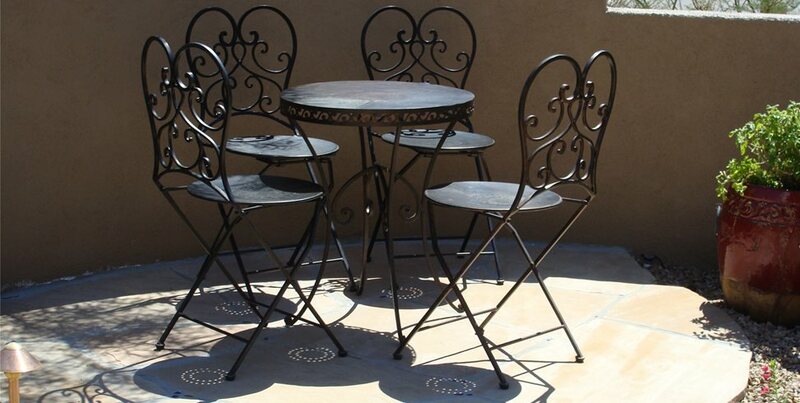 The homeowners already owned a small table and chairs that they wanted to include. 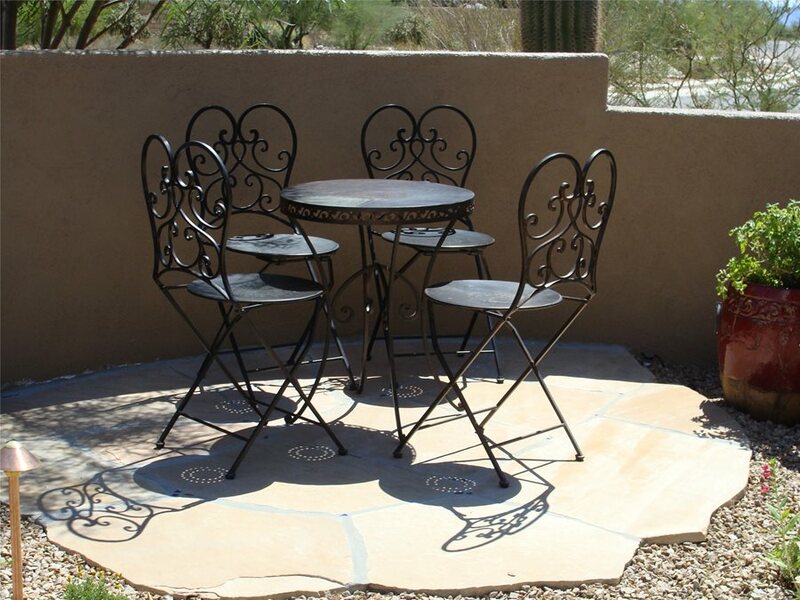 So Gioannini designed a flagstone patio for the family to spend time on in the evenings. She located the patio so that it would take advantage of evening shade from the house and morning shade from the existing acacia tree. 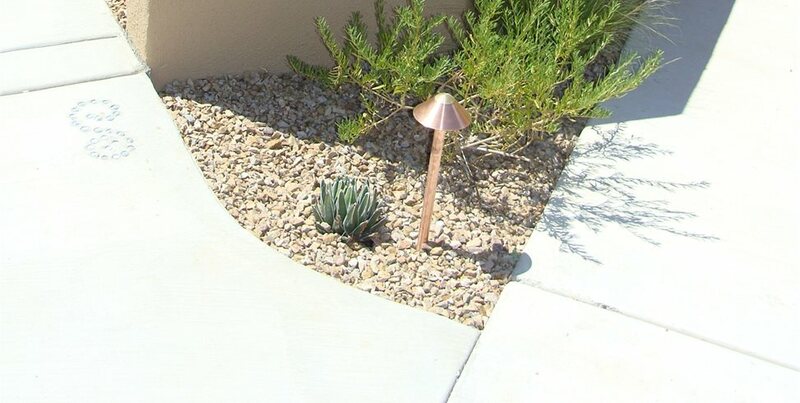 In a desert climate, shade is essential for comfortable outdoor living. Before the transformation, on the rare occasion of rain, run-off from the roof would collect near the foundation of the home. This was a problem that could cause severe structural damage plus it was a waste of a valuable resource. Once the walkway was torn out the property was re-graded to solve this problem. Gioannini also added a detention basin that captures the run-off and weep holes were drilled into the new wall to allow excess water to flow off site. The couple's young children and their family dog motivated many of Gioannini's design decisions. "While the main play area was to be located in the backyard, I still wanted to ensure that the front courtyard would be a safe and stimulating spot," she explains. 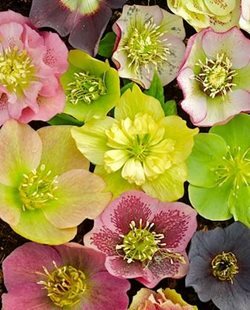 Gioannini avoided including any pokey cacti or other plants that could be dangerous, opting instead for safe plants that are far from fragile. 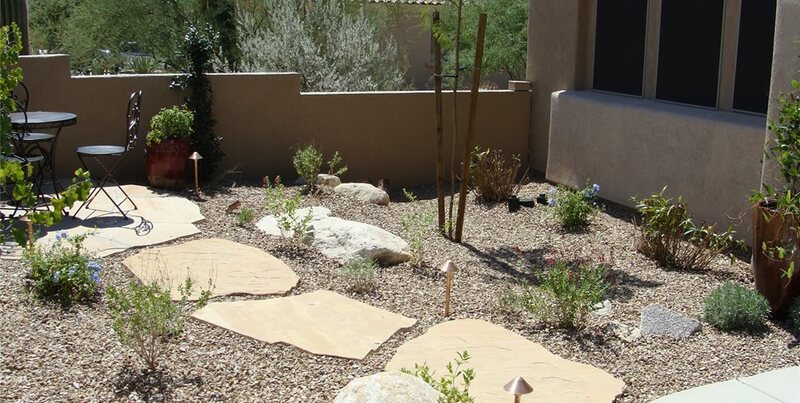 Additionally, the indigenous Catalina boulders which were incorporated into the yard make for great places for the kids to play. Pro Tip: Always bury boulders one-third below grade. If this isn't done, they end up looking as if they've fallen from the sky. This family no longer has an average front yard. Now their home is distinguished from the neighbors by an inviting courtyard. "The end result is a colorful space that the family loves to spend time in," says Gioannini. 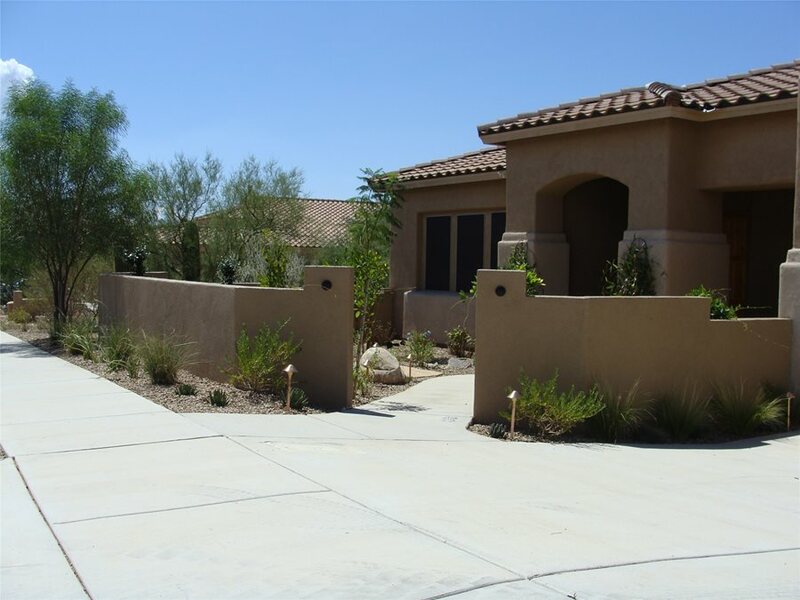 This project proves that having a lush garden in the desert is a possibility.